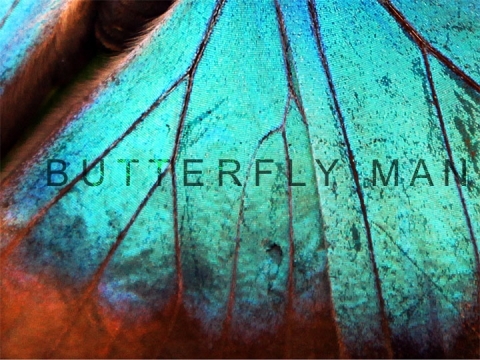 Part of Mayfest, Butterfly Man plunges you into a story from writer Nick Hunt, examining the psychological after-effects of one man’s loss, set against the world’s. 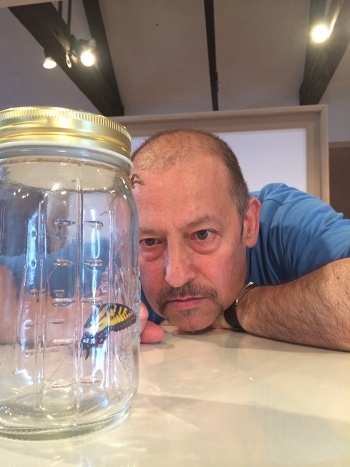 Using audio and visual projection to heighten the viewers’ emotional states, this thoughtful one-hour play begins with Ben (played by Joe Hall) holding a jar containing what seems to be a real swallowtail butterfly (I’m assured it wasn’t harmed in the performance), and reliving a moment in past. The sound of the creature’s wings beating against the glass provides a constant background of noise as we watch Ben’s descent into depression following, but apparently not connected to, a tragedy in his family. Instead we are led to believe his breakdown in fact relates to a much earlier trauma, when the woodland idyll near his childhood home and all the wildlife living in it was destroyed. This is a work in progress, and while parts of it were beautiful and haunting (the scene in which Ben meets his doctor for the first time is incredible believable), others need something more. The final scene involved huge amounts of dialogue from Ben supposedly spoken to his partner (played by Amanda Horlock), but the two rarely make eye contact. I wanted them to be clinging to each other as he described discovering butterflies for the first time, and learning from them about love. This intensity may well come, however, as the actors and co-directors welcomed for feedback after the performance, and are evidently keen to see their caterpillar of a play metamorphose into the butterfly it clearly has the potential to become. The message is already there – that in harming our environment we risk damaging our own mental health – in fact there’s a lovely line from Ben at one point explaining that the Greek word psyche means both spirit or soul, and butterfly – binding the play’s ideas together in one neat package. Find out more at nickhuntscrutiny.com/news/butterfly-man. One thing definitely not lacking in Hardy Animal – written, created and performed by Laura Dannequin – is intensity. Disarming in its portrayals of the frustrations, fears and hopes of a dancer enduring chronic back pain, it explores the lengths we’ll take in a bid to restore normality, the confused perceptions we’ll face from others, and the strength required to unlearn and relearn our own body’s capabilities. It’s a beautiful and stark work, almost poetic at times, painterly at others – using spoken work, careful lighting, the vulnerability of exposed skin, and, at last, a brief, extraordinary dance that draws the whole thing together into a moment you’ll feel you’re truly a part of. Powerful, and unexpectedly uplifting. Find out more at www.lauradannequin.co.uk. Mayfest kicks off this month (as you might expect) in Bristol, with a line up dedicated to “presenting a broad range of unusual, playful and ambitious work from leading theatre makers from Bristol, the UK and beyond.” As with last year’s stellar programme. I have a feeling that the main challenge will be choosing what NOT to go to. The festival runs from 15-25 May 2014, with performances taking place throughout the city, in venues ranging from Bristol Old Vic Theatre to the Trinity Centre to Leigh Woods, for the tantalising Nightwalk exploratory event with artists Tom Bailey and Jez riley French. What will you experience this Mayfest? Explore the full 2014 programme and more. On Thursday night I had the chance to see Cooking Ghosts at the Tobacco Factory Theatre, part of Mayfest’s extraordinary offerings. Using genuine vintage footage from Beady Eye Theatre founder Kristin Fredricksson’s childhood, the show blends this with audio-snippets, props, puppetry and some truly exuberant dancing. This is a tragedy tenderly told with grace, generous abandon and moments of utterly raucous laughter. It is a noisy, chaotic, poetic, beautiful and sometimes painful portrayal of childhood bewilderment as Kristin and her twin sisters cope with the uncertainty of a mentally unwell mother. I left feeling both emotionally drained and emotionally enriched, resisting the urge to hug everyone involved. If it comes anywhere near you, go and see it.